Today’s object gets a nod because of a recent unintended doubly-off-label usage. A few years ago I ordered some furnace igniters online. Within the package, they had included this promotional wine bottle opener, today’s Object at Hand. Wine and furnace repair seemed an odd non-sequitur, but I found a use for it: This bottle opener has sat on my counter as a fine and efficient letter opener for years. But a few weeks ago, I knocked it off the counter and it stuck vertically into the wooden floor right by my foot. You can picture the sound of it quivering there. I felt lucky that it had missed my foot. The same physics of angular momentum that causes toast to land butter side down gives this device good odds of sticking the floor. Then a few days ago, I was setting a package on the counter in the dark and I heard a “thunk,” and felt a pain in my toe. I looked down. The letter opener lay innocently on the floor next to it. There was a small red spot, growing larger, near the center front of my sock. Yeah, in the winter I wear socks in the house. I pulled off the sock, and noticed that the blood was coming from the middle of my medial toenail. I soaked up a few minutes of bleeding with tissues, then put on a band-aid. My coagulation is good; it stopped bleeding in minutes. Here is what it looks like a few days later; pretty neat as punctures go. Not the best of pedicures, either. This reminds me, I’m due for a TDaP, or DTaP, or whatever they are calling the standard 10 year vaccination nowadays. I recall an article in Byte magazine (I think) by Jerry Pournelle (perhaps) back in the mid 1980’s about his adventure when his son lost the IBM mouse ball at the mall. Back then, there was no internet, few electronics stores, and even Computer Shopper was a thin monthly magazine with few aftermarket parts. So he finally got a replacement mouse from IBM, because no one could be found to provide a simple rubber ball of just the right size and weight. 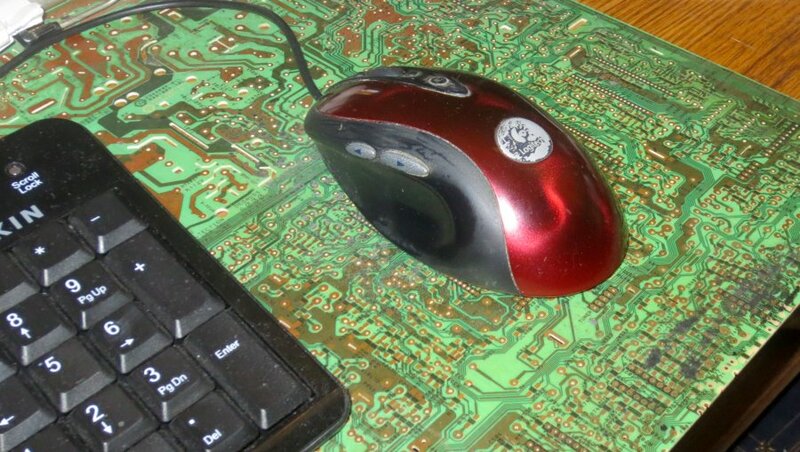 Anyway, I thought of it when my current mouse, a 13 year old Logitech Mx510 optical mouse, lost the ability to wheel down. Back in the ball-mouse days, one had to clean the rollers regularly. 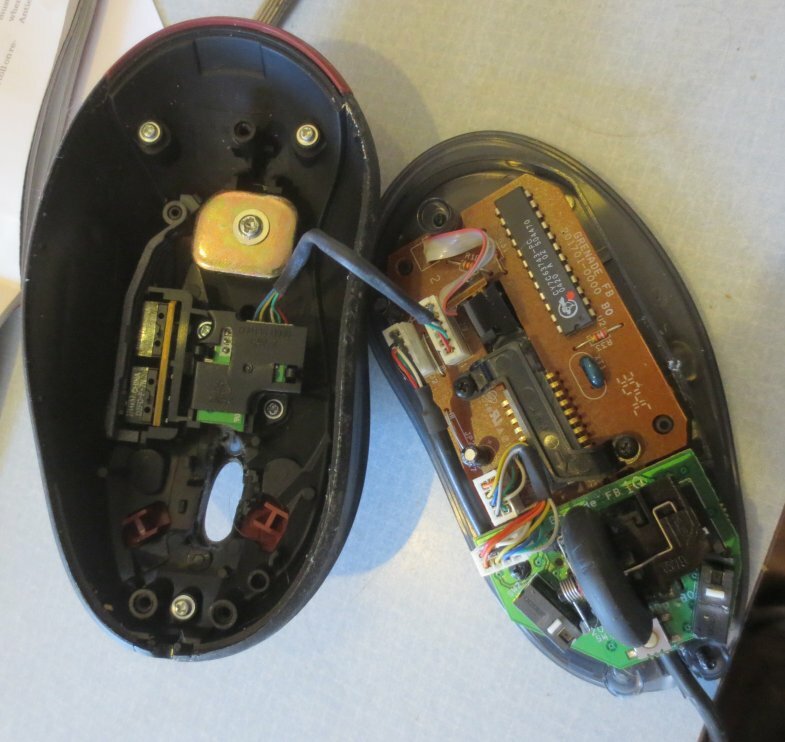 But the optical mouse is nearly sealed, and has few moving parts. But Google agreed that the likely problem was dirt. In over a decade, enough dust (crumbs, skin) did filter in through the wheel-side slots to block the sensor. So here is today’s Object at Hand, the fuzzy internal workings of the scroll wheel. Light passes through the spokes (when clean) and tells the processor which way and how far it turns. There are several loose parts in this assembly, and it took me a little while to get them back in the right order after I pulled the tiny carpets of fuzz from many tight internal surfaces. But back together it went. For those of you who don’t bake, a dough hook is a mixer attachment for kneading dough. As I don’t make bread, mine sat idle for decades until I had this thought, which I present as a recipe on the thin premise of dough hooks as today’s Object at Hand. I began making meatloaf when I was a college student. I lived in apartments and didn’t have a meal plan or a budget to support eating out, so perforce learned to cook. Every month or so, I’d mix up a meatloaf and eat it for a couple of dinners and several lunches. Anyway, I recently began cooking again and decided to re-think how I made a meatloaf. The part I disliked was getting my hands cold and slimy by kneading everything together. So in my fifties, I finally thought to try doing the mixing with the dough hooks on my little Krups consumer grade mixer. The title “Doh!” is about it taking me so many decades to figure this out. I begin by tearing up a couple of bread heels (from Ezekiel bread, but that isn’t important) and throwing the pieces into the mixing bowl. couple of cloves of garlic and add those to the mixing. about a cup of rolled oats (not steel cut nor quick). I pulled the leafy core from a bunch of celery and chopped that to add in, more for a flavor note than vegetable value. I finally add a pound of ground beef (85% lean from Trader Joe’s). By now I had to turn the mixer up to high to massage the tough, fibrous blend. Then I turned off my electrical slave and scooped the mixture into a large bread pan, pushing down the center and leaving a raised lip around the edges, because we like the crispy bits. cover that with crosswise half-overlapped bacon. The cereal allows the bacon to get good and crispy while absorbing some of the yummy fats. So I place the pan in 350°F for an hour, then boost to 400 for another quarter or so to brown the bacon. Finally, I take it out and set it on an metal pan spanning plates below the ceiling fan (much like the heat sink on your CPU) to cool it more evenly, an allow it to firm up. 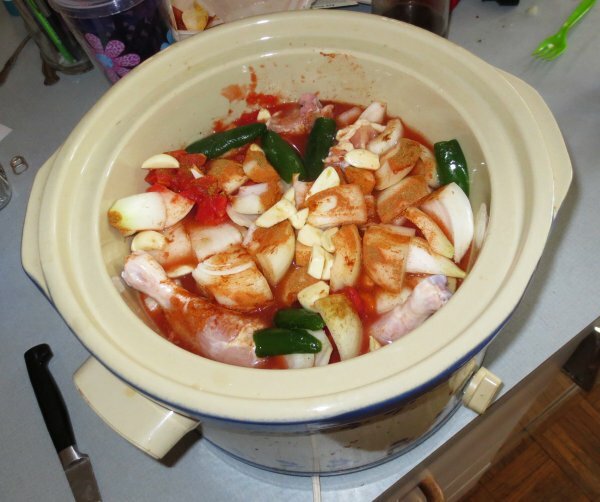 Today, the Object at Hand, is my energy efficient crock pot and its summer use outdoors to produce “Meskin Chiskin.” Or Mexican Chicken, should you prefer to eschew cutesy neologisms. One room in which keeping cool really matters is the kitchen. I don’t have central air. 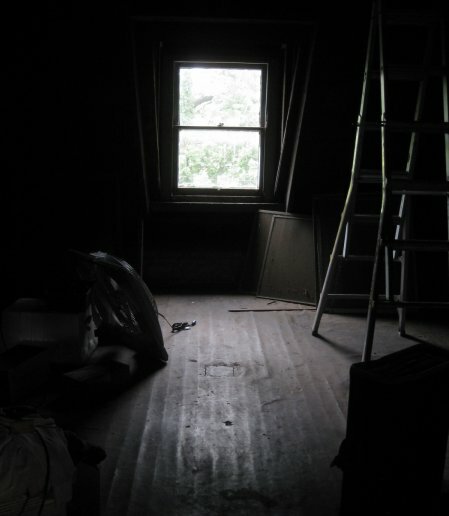 I grew up in a 1920’s house with window units in the bedrooms. I had no air conditioning at all in any of my college apartments where I cooked my own meals. And now in my 1890’s house, I again just have a few strategic window units. This situation helps keep me aware of how much it costs to keep cool; both in dollars and carbon. A refrigerator pumps out quite a bit of heat on its own. So in the summertime, we spend much less time and energy cooking indoors. In the air conditioning season, there is a particular penalty for using appliances. Every watt you use indoors (lights, TV, toasters, microwave, fridge, etc.) produces 3.4 BTU’s per hour. Then you burn another half watt or more to remove that heat via the air conditioner. 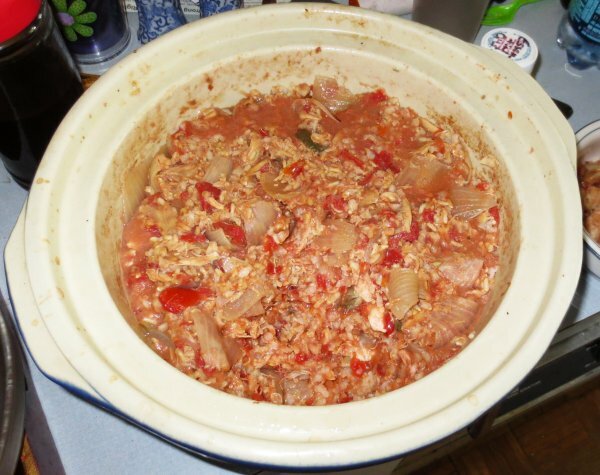 So if you want to slow cook a meal with a 250 watt crock pot for five hours, you spend the 1.25 kilowatt-hours for the cooking, plus another 0.6 kilowatt hours to remove the heat. That’s assuming a high efficiency, properly cleaned and maintained A/C. Plus, it heats up the kitchen until the heat can get pumped back out. So I decided to put out the crock. 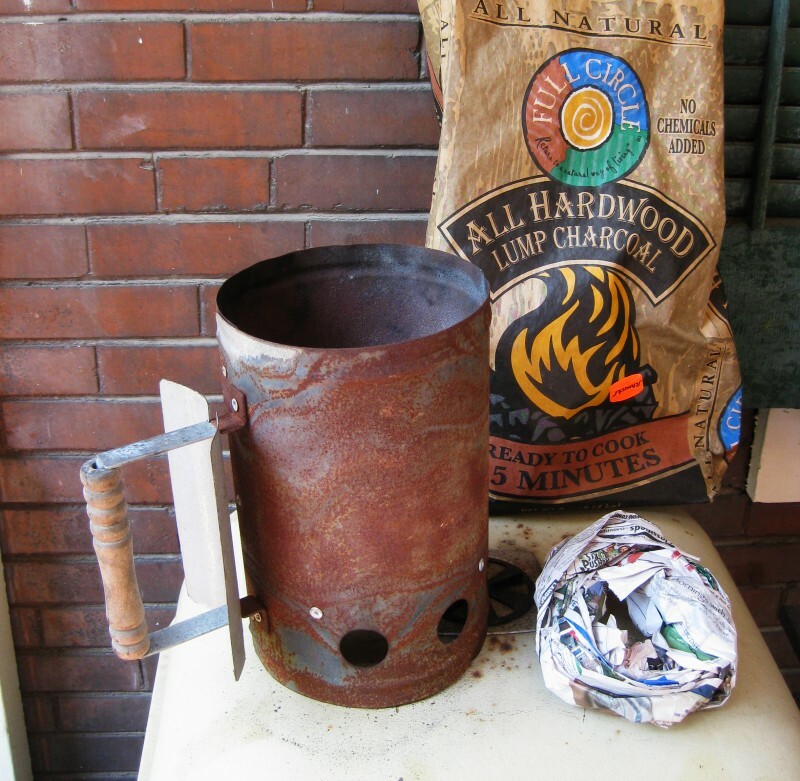 Yes, I fill it in the kitchen, then fire it up outside, where it bleeds its waste heat into the already sultry air. A few cloves of garlic, peeled and broken. After 5 hours, I pulled out the bones, from which the meat has fallen, and added the rice and preheated chicken broth (because it didn’t have enough free liquid left for the rice). Another hour or two later, we have something like a risotto, but with a southwestern flavor. And all those cooking BTU’s did not fill the house, nor require that much more energy to remove them. When I was in third grade, in the 1960’s, I noticed that my teacher would open and close windows in peculiar ways during the warm part of the year. The early 20th century building had nice high ceilings with windows that went from the radiators up to nearly the top. Every afternoon, she would open the normal bottom sash about a foot, and then used a special pole to pull down the top sash by a foot. In the mornings, she would close them to keep the cool air in. 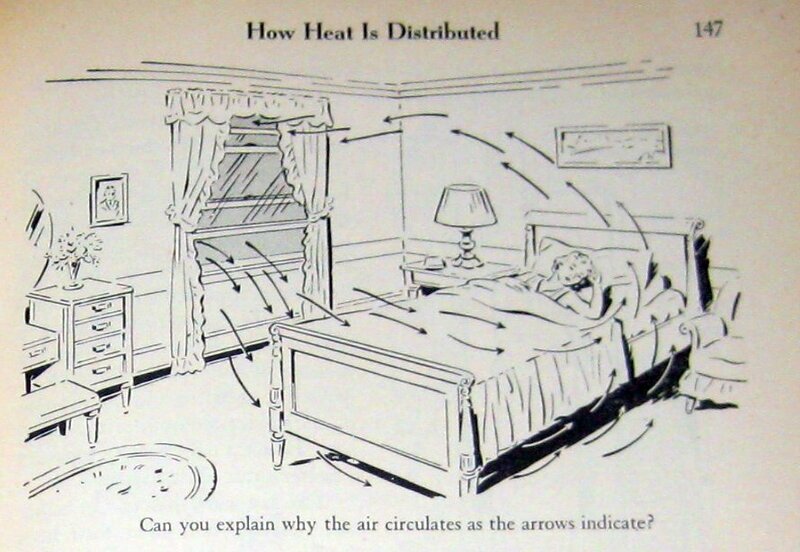 A few years later I got a vintage high school text book at a yard sale in which they suggest that the best way to cool off a room at night was to open the top and bottom sashes to let the cool air in below and flush the warm air out above. That made sense. But most people are not even aware that top sashes can move. Before that school year, I was one of them! When I moved into an 1890’s home with 10 foot plus ceilings, I decided to vent the bathroom by opening the upper sash for much of the year. For many years, I would reach up over the top of the closed lower sash and push on the lower part of the upper sash vigorously with my crooked fingertips to open it a crack. Closing was much easier, using a broom stick or any convenient 3′ or longer rigid object. But as opening was not a trivial task, the window often stayed open a few inches from warm-enough in the spring till getting-too-cool in the fall, with occasional shuts for really hot days. Not the most energy efficient air management. Finally, I decided enough was enough, and went online shopping for a proper vintage sash lifter; today’s Object at Hand. 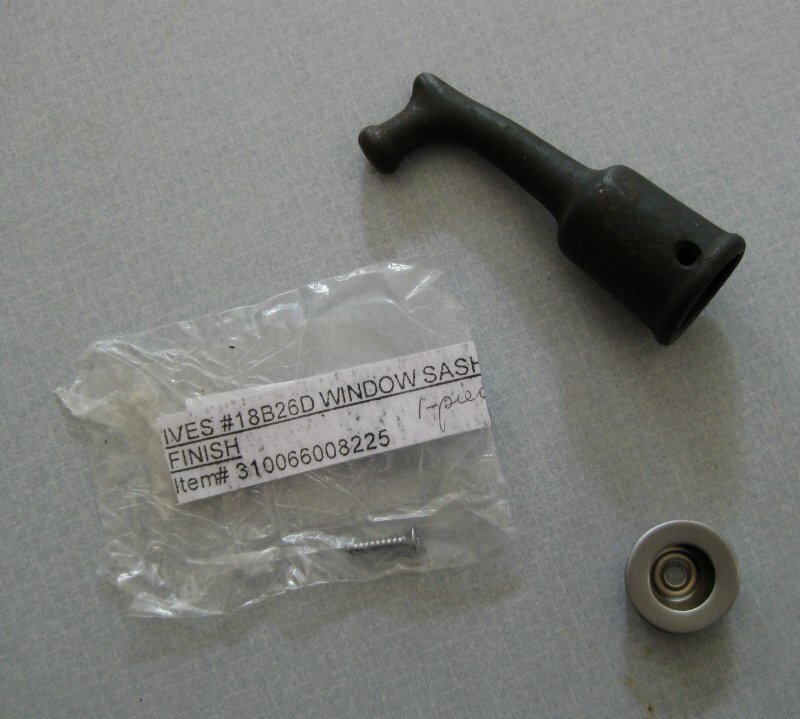 A vintage cast iron pole tip was not hard to find, and the metal inserts to allow me to pull the upper sash from the top is still in production! So armed with these parts, I needed only to buy a pole. 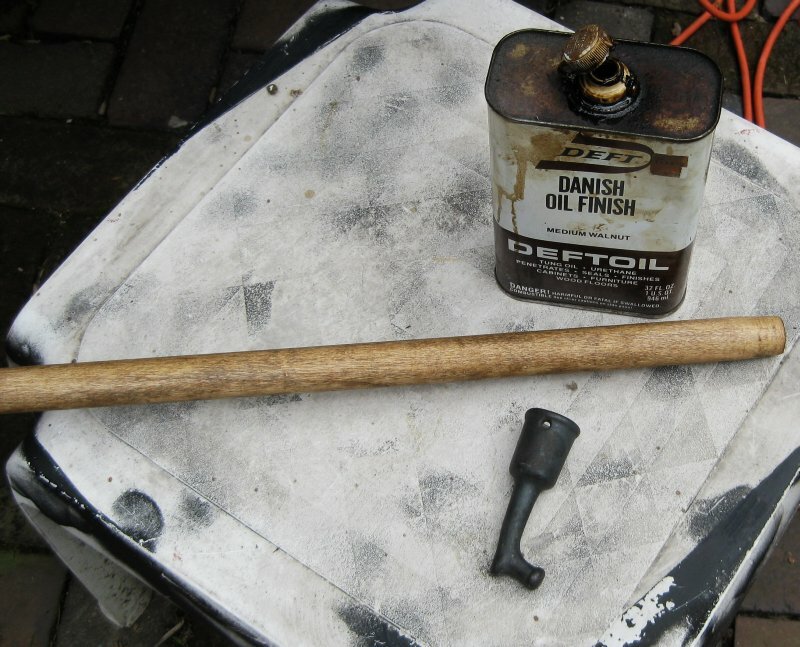 Fortunately, a 1″ diameter hardwood dowel at four feet length was conveniently available at a big box hardware chain store. So I rounded one end of the dowel with a file and sandpaper, and tapered the other end with similar technique. Then sanding, staining, and varnishing took a couple of days of mostly waiting. Then I drilled a hole in the old sash for the insert, mounted the puller on the pole. 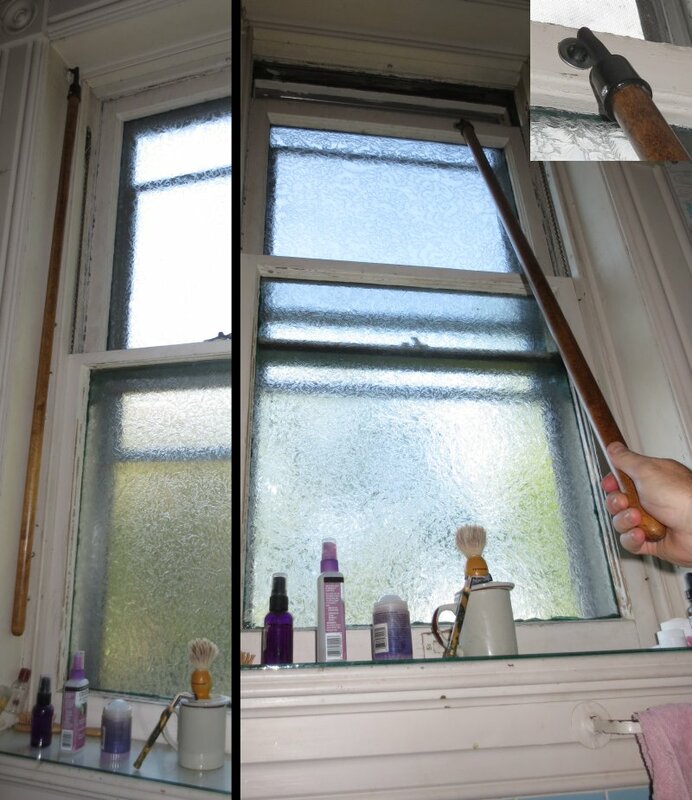 Now either I or my petite spouse can easily take the pole from where it hangs at the side of the window and pull open or push closed the sash at whim. So here is how it looks in use on our 119 year old window. On the left, hanging on the old roller shade holder. On the right, in use, with a detail of how it fits in the socket. 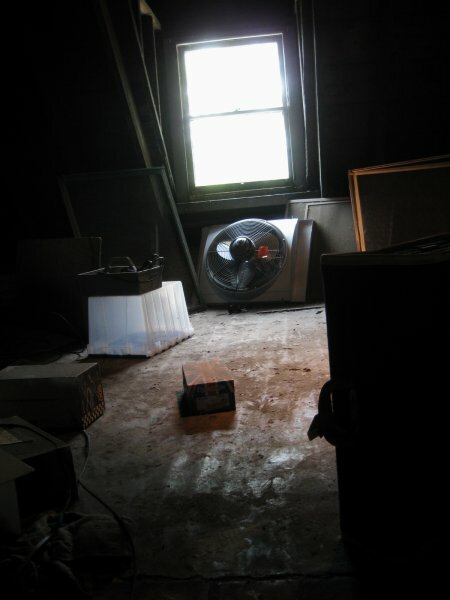 One of the energy saving measures that I grew up with was the use of a whole house exhaust fan on cooler summer nights. 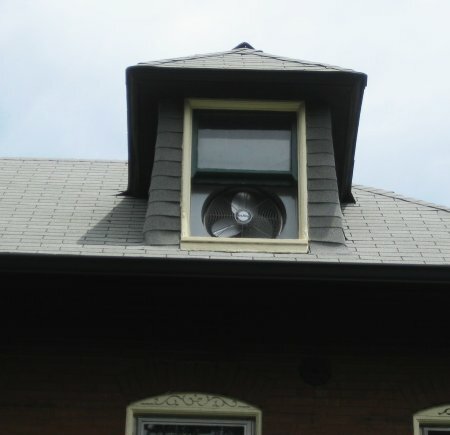 When I bought an old Victorian house, and didn’t yet own window air conditioners, this seemed an obvious expedient. Or a “Duh,” in the parlance of world weary (i.e: inexperienced) youths. After a decade and a half, my first big fan wore out; a bearing seized. The big box hardware stores no longer seemed to carry such units, so I replaced it on the cheap, online. Much to my chagrin, it turns out that a) You get what you pay for, and b) There are no published ratings on consumer grade fans for how much air they move, nor how efficiently. 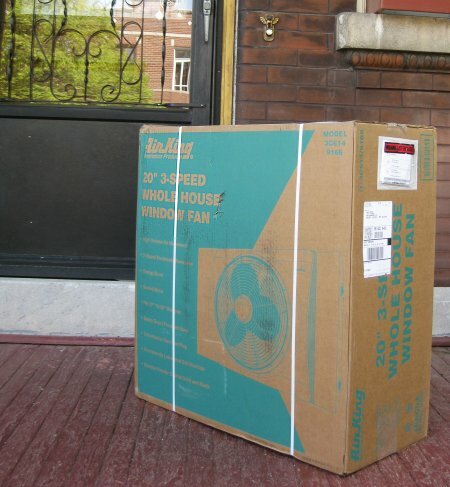 I did some research, and ordered a more expensive commercial grade, window-mounted, whole-house exhaust fan. So today’s Object At Hand is a 20″ Air King Model 3C614/9166. It arrived in a few days. I suspect that our UPS guy is afraid of our doorbell, and is also too shy to knock. I am usually home, yet packages regularly materialize on the porch without any annunciation from their deliverer. So far, we have discovered them before local opportunists made off with them. But this is not the point. I bought this fan in April 2012, the start of a record hot summer. The nights last summer were never cool enough to use the fan (rarely dropping below 80 before dawn). So the fan sat in the attic in its box until this spring. 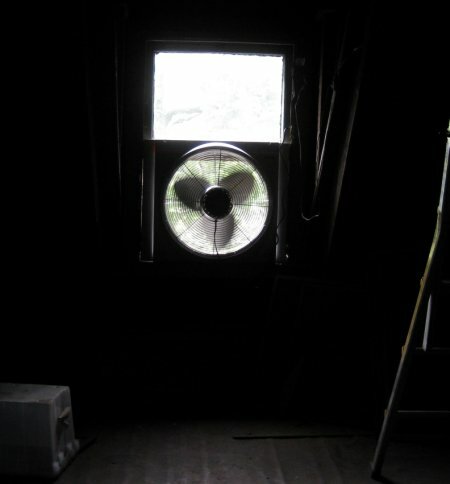 That is when I found out that the western breezeway window that I’d used before was only 20″ wide; too small for this 20″ fan. 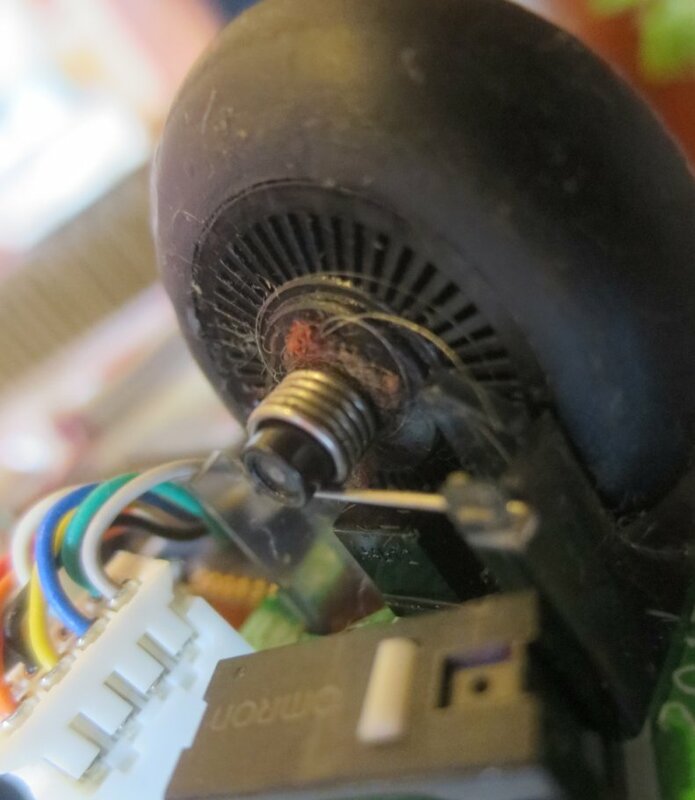 My mistake was not realizing that, although a 20″ consumer fan is a fan in a 20″ box, a 20″ commercial fan means a 20″ diameter blade, plus housing. My previous one must have been the 16″ model. Now with this post as documentation, my next one will be, too. So I had to use the larger southern window. The attic had not been cleaned in decades. So my first task was to vacuum a trough through the dry accumulation of dust that many years of pulling the household air through the attic had deposited. I ran an extension cord from one of the ceramic light fixtures reachable only by ladder, so that we can turn on the fan by by pressing the light switch at the foot of the stairs. I did have to reinforce the 115 year old, marginally maintained, double hung window frame to accept this heavy and almost too large fan. Luckily, the sash cords on this window had already been replaced by chains, so the window opens and closes fairly well. You can see in this picture that the upper sash does not clear the fan area. What you cannot see is that I had cut away part of the metal fan frame in order to fit it lower down on the sill, rather than up in the raised sash guide area. But this monster does pull quite a bit of air from the far corners of the house. As the final chapter in my starting-a-grill triptych, I will address the starter tube itself. So today’s Object at Hand is a starter tube brought back from the dead. It doesn’t look like much, sitting here with the subjects of my previous two posts. But this starter chimney has had a good life so far, and recently was falling apart. Sure, the tube is rusting badly. But it is not yet rusted through. The failure was that the rivets holding the handle had worked loose, and the ones holding the charcoal tray up had rotted clean off. So I had to choose between spending a sawbuck or so on a new replacement, making a forever-lasting one out of titanium that MrTitanium happens to have on hand, or resurrecting this old and faithful servant. Fortunately, I had some heavy duty pop-rivets on hand from recently repairing an aluminum ladder. So I spent an hour of delicate surgery aligning, clamping, re-drilling, and pop-riveting, and tightening other rivets with a hammer and punch. This rusty old wreck now performs as good as new! One of my peeves is that they don’t only make these from stainless steel. They do exist in stainless, but are harder to find and cost at least triple. I grant that stainless at red hot does in fact stain. But the much slower corrosion of the tube, and the use of stainless rivets, mean these end up in estate sales rather than landfill.